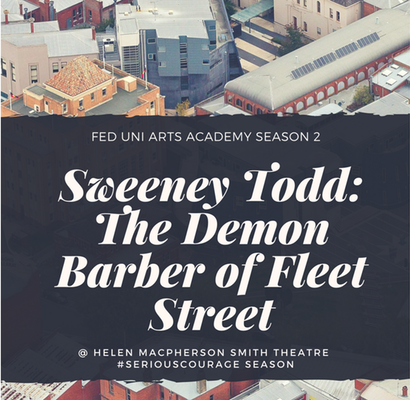 Sweeney Todd (music and lyrics by Stephen Sondheim, book by Hugh Wheeler) is a horror musical that tells its tale with the Graduating Musical Theatre students of Federation University, Ballarat at the Helen Macpherson Smith Theatre. Directed by James Cutler. Music direction by Rainer Pollard. This performance is also part of the 2017 VCA Master of Directing for Performance season, showcasing brand new works by Australia's next generation of artistic change-makers. The season of shows spans everything from new Australian musical theatre and explorations into devising new works, to fresh visions of classic texts from Europe, China and sub-Saharan Africa.